A black, thumb-sized missile sails through the jungle air, a thunderous buzzing announcing its arrival. The massive insect lands heavily on a tree-bound termite nest, taking a moment to fold its brassy wings and stretch its humongous, curved jaws. This is Wallace’s giant bee, the beefiest and bumbliest bee on Earth. After going missing for nearly four decades, the species has just been rediscovered in its native Indonesia. Wallace’s giant bee (Megachile pluto) gets its name from its original discoverer, Alfred Russel Wallace, the British naturalist famous for independently conceiving the theory of evolution through natural selection alongside Charles Darwin. 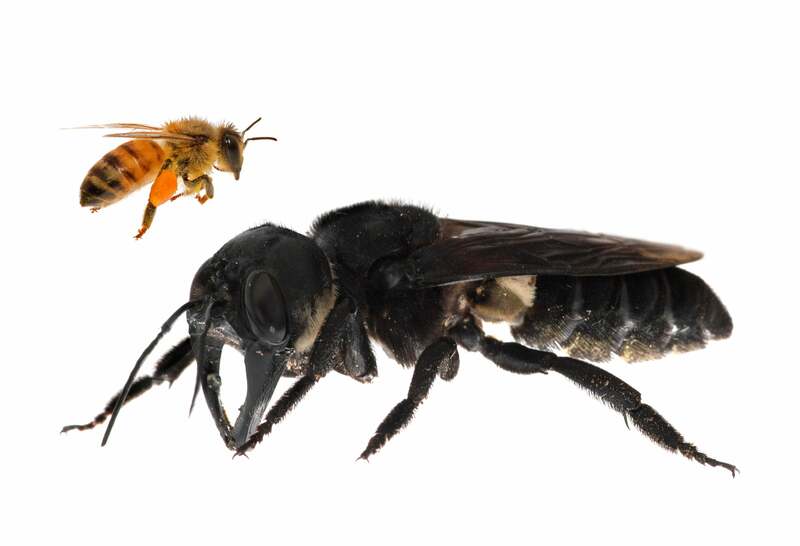 Wallace collected the bee while on an expedition in Indonesia’s North Moluccas islands in 1858, describing it as a “large black wasp-like insect, with immense jaws like a stag-beetle.” The tiny titan then went more than a century without being spotted by Western scientists, only seen again by entomologist Adam Messer in 1981, who was able to observe some of its behaviour on a number of small islands. But since then, no one had documented any encounters with the huge bee. That all changed when a search team visiting the North Moluccas last month laid eyes on the bee for the first time in 38 years. 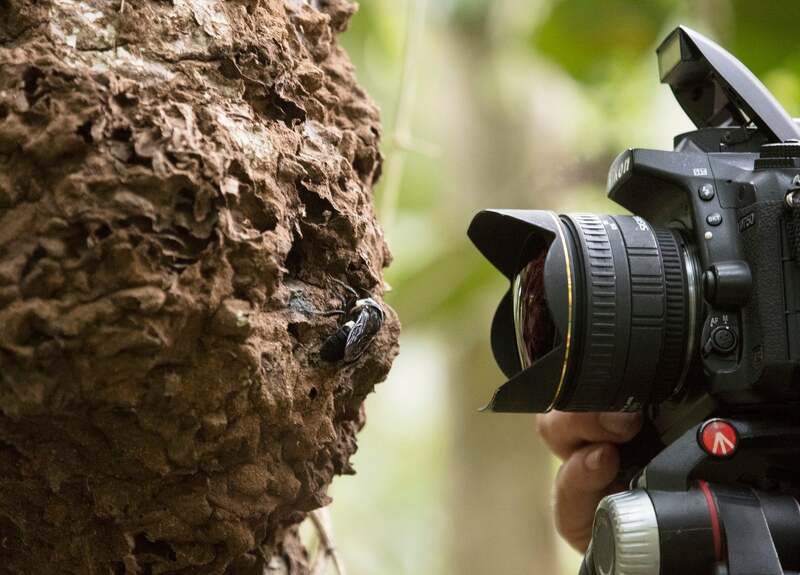 The rediscovery comes after years of hard work and planning, according to Clay Bolt, the nature photographer that documented the giant bee last month. Several years ago, Bolt was visiting the bee collections at the American Museum of Natural History, familiarising himself with North America’s own native bees for a project documenting the underappreciated insects. Eli Wyman, an entomologist at the museum, showed Bolt a remarkable, rare specimen of Wallace’s giant bee, and shared his desire to see the insect in the wild. Together, the two hatched a plan to travel to Indonesia to find the bee. “We weren’t exactly sure how we were going to pull it off,” Bolt said. There was little information about the bee’s natural history, so finding suitable habitats in which to search was difficult. In the middle of this planning, Bolt successfully pushed to get the giant bee a “25 most wanted” spot on Global Wildlife Conservation’s Search for Lost Species program, which seeks to fund expeditions to find species that have gone MIA. When Bolt and Wyman saw that a mysterious giant bee specimen had sold for $9,000 (£6,903) on eBay in early 2018, they were met with a new sense of urgency to find the rare bee. After connecting with other researchers interested in finding the bee, Bolt and Wyman formed a search party that embarked for Indonesia in January. 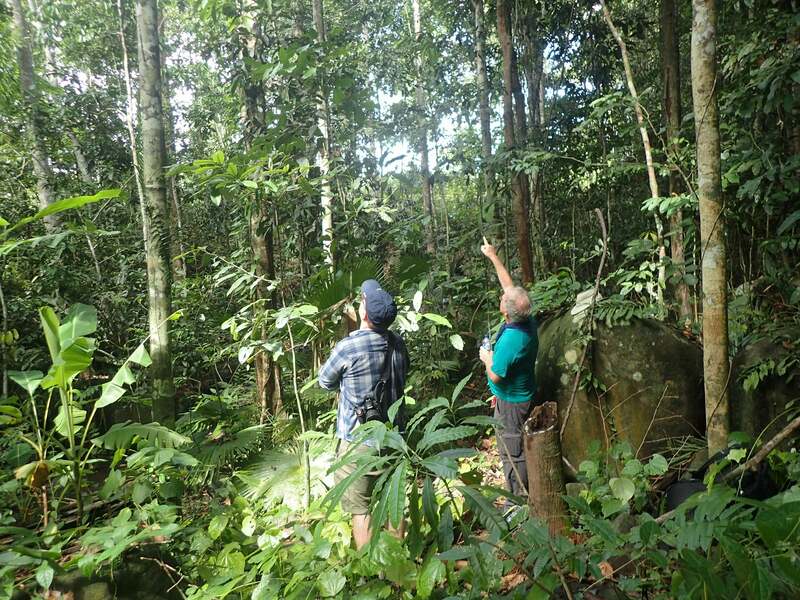 The team spent nearly a week exploring lowland rainforests in the North Moluccas, where they powered through extreme humidity and heat, interspersed with torrential rainstorms. There were few clues as to where to find the insects, barring the bee’s unusual nests, which are carved into active termite mounds in trees. These miniature in-law suites are carefully lined with resin to keep water and termite neighbours out. So, the team searched for nests, splitting up and watching termite mounds with binoculars in the hope that a big buzzer would show up. After days of fruitless searching, the expedition reached its final day. Iswan—an Indonesian guide with the team—noted a low-lying termite mound, and upon further inspection, saw a round, quarter-sized hole drilled into its side; just big enough for a Wallace’s giant bee. When Iswan climbed up and peeked inside the hole, he recoiled, thinking he saw a snake move inside. After Wyman took a look and thought the resin-slicked chamber looked exactly like a bee’s nest, Bolt peered in with a headlamp. It was no snake, but Megachile pluto herself, blocking entry to her abode. Ecstatic, the team capped the nest’s exit with tubing so they could collect their thoughts without the bee flying away. When it was the bee’s time to shine, Bolt tickled her with a bit of grass to get her out of the nest, where she proved every bit as magnificent as the museum specimen, and then some. Four times the size of a honeybee, Wallace’s giant bee is a sight to behold, and more than deserving of the name Messer gave the species in the 80s: “Raja ofu”, the king of bees. While the long jaws are unnerving, they aren’t for nipping, instead being used to transport globs of resin back to the nest. So, more like salad tongs than pincers. The bees also live solo, and don’t have the defensive, stinging tendencies of their hive-dwelling relatives. After taking plenty of photos and video of the incredible insect, Bolt had accomplished a worldwide first: photographing a living Wallace’s giant bee. Now that the bee has been rediscovered, Bolt says there’s plenty of work left to do towards the species’ protection. There needs to be additional study on how many of the bees are even around, and what habitats they use. Bolt noted that a relative lack of local knowledge of the bee’s existence is somewhat reassuring, since very few people know where the nests are overall. But the flipside of not being aware of special biodiversity means that there’s no way to protect key habitats against destruction or other threats. Bolt said the next steps are to work with Indonesian researchers and conservation groups to set up protection for the bee. One route might involve elevating the giant bee as an avatar of the local biodiversity, much like what has been done with the Wallace’s standardwing, a bird in the region. For Bolt, the rediscovery of Wallace’s giant bee is a ray of light in an otherwise dark time for Earth’s biodiversity. “This really offered me hope. There’s so much bad news that’s coming out, with all these species being lost, and I think sometimes it’s easy to just give up and say ‘there’s no hope for anything’,” Bolt said. 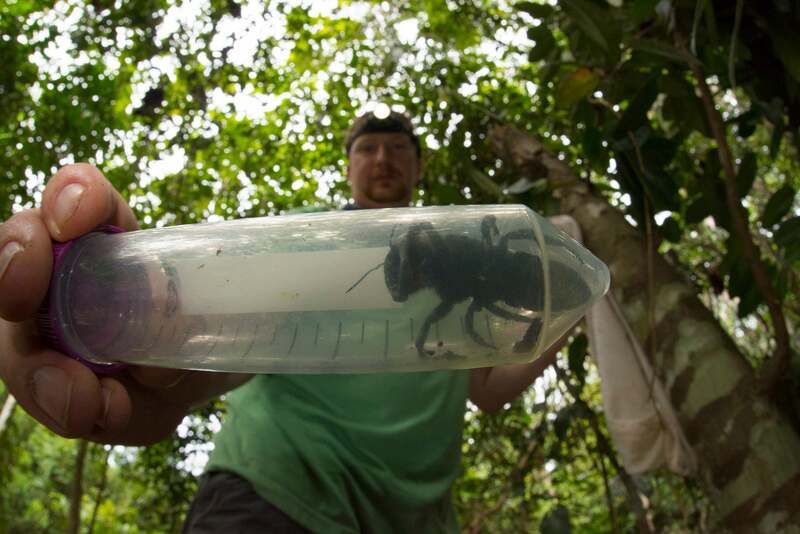 Wallace’s giant bee shows that, with time and effort, even long lost species can be found again.